Of the two closely related species, Southern and Northern Cloudywing, the Southern was the first to be described. Its life stages were drawn by naturalist John Abbot in Georgia, sometime between 1783 and 1792, and on this basis it was named by J. E. Smith in The Rarer Lepidopterous Insects of Georgia, published in 1797. Today, the continental range of the Southern Cloudywing is more restricted, more southerly and easterly than that of the Northern. Whereas the Southern does not extend very far into Canada (Layberry 1998 terms it “generally rare”), and is found westward only to the plains states, the Northern co-occurs in all of the Southern’s range, and is found in northern Canada and west to the Pacific and southwest states. In New England, Scudder followed Smith’s genus name, but in 1870 distinguished the Northern as a separate species, Thorybes pylades. He reported that Southern Cloudywing had “only been taken in the Connecticut valley.” He cited specimens from Springfield (Emery), Sunderland and South Hadley (Sprague), Mt. Tom (Morrison), and Granby (Scudder) (1889: 1435). The F. H. Sprague specimens from South Hadley (1885) and Sunderland (1886), are in the MCZ today, but though originally labelled bathyllus, they have been re-classified by the MCZ as pylades. However, they appear on dorsal inspection to be actually Southern Cloudywing, as Scudder and Sprague thought. These specimens should be examined again by an expert, since the species' historical presence in the Connecticut River valley depends upon their correct identification. Ace collector F. H. Sprague found only Northern Cloudywing in the Boston area between 1878 and 1896, not Southern. All of his 25 or more Cloudywing specimens from Wollaston and Malden in the MCZ are classified as Northern Cloudywing, although a few look similar to Southerns and would bear re-examination by an expert (e.g. Wollaston 6/6/1878 and 6/1/1896, MCZ; Sprague 1879). The many other 19th century collectors in eastern Massachusetts also did not find Southern Cloudywing; It appears that in the late 1800s the Southern Cloudywing was not present in eastern Massachusetts and only possibly present in the lower Connecticut River valley (Stichter 2013b). The earliest reliable records of Southern Cloudywing in eastern Massachusetts are in the 1930's, from the offshore islands of Martha's Vineyard and Nantucket. At Boston University there is a 6/25/1930 F. M. Jones specimen from Martha's Vineyard, "Plains Area" (det. A. E. Brower, 1939). There is at least one other early specimen (no year) mentioned for the Vineyard. For Nantucket, C. P. Kimball reports a specimen from 6/30/1940 (Jones and Kimball 1943). There are also two specimens in Maria Mitchell Museum (Kimball Collection, n.d.). But the species does not seem to have been common on the islands. It seems probable that the Southern Cloudywing first arrived in mainland eastern Massachusetts sometime between the 1930's and the 1960's, expanding its range northward from Connecticut (Table 2; Stichter 2013b). The earliest documented eastern mainland occurrences seem to be the specimens of W. P. Rogers, from Fall River and Bliffin's Beach (Bristol.Co.) in 1936, 1940 and 1941 (Yale Peabody Museum). In addition, there is a 6/10/1942 specimen from Wellesley, V. Nabokov, MCZ, which may be Southern Cloudywing, and a 1949 specimen from Waltham (no coll., poss. Gottschalk) labelled bathyllus at Yale. Most reliably, there is W. D. Winter's 7/13/1966 male specimen from Westwood (determined by J. M. Burns in 1975) at the Harvard MCZ. Winter also collected Southern Cloudywing in Medfield, Sherborn, and notably Chelmsford north of Boston, in 1974 and 1975 (all except Sherborn determined by J. M. Burns). In the northern Connecticut River valley, Southern Cloudywing was solidly documented for Montague sand plains by D. F. Schweitzer July 1, 1974 (specimen at Yale). In general, by 1960 lepidopterist W. T. M. Forbes remarked that Southern Cloudywing was “much commoner in Massachusetts in recent years than in the early 1900s” (Forbes 1960). The butterfly may possibly have expanded its range eastward from western Massachusetts, as S. Goldstein suggests in the MAS Atlas, but more likely it simply moved northeastward from Connecticut, where it was present at least from 1939. Southern Cloudywing uses a variety of dry upland habitats, including disturbed areas if native vegetation predominates. 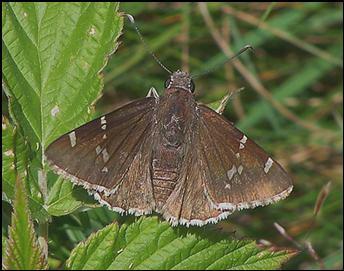 Northern Cloudywing uses similar habitats, but is not as limited to dry sites. Although these two species share many of the same host plants in the Fabaceae family, there appears to be some plant specialization, which may help account for the differing distributions in Massachusetts. In our area, both no doubt use primarily the Desmodiums and Lespedezas, which are widespread and common. But a possible native host for the Southern Cloudywing in our area is trailing wild bean (Strophostyles helvola), sometimes called beach bean, which is native to our coastal counties (Sorrie and Somers 1999; Magee and Ahles 1999: 686). The distribution of this plant coincides roughly with the 1986-90 Atlas distribution of Southern Cloudywing. Northern Cloudywing, on the other hand, is known in many areas to make use of a different plant, hog peanut (Amphicarpaea bracteata) which is native to and found in nearly all Massachusetts counties. Both Southern and Northern Cloudywings apparently quickly adopted introduced legumes (Table 3, Switchers). The Northern was especially adaptable: in our area it has been found on clovers since Scudder’s time, and is reported from many other introduced species. The Southern, on the other hand, appears to have adopted only one non-native species in our area: red clover Trifolium pratense, although it uses soybeans in southern states. The Connecticut Atlas found eggs or larvae of Southern Cloudywing in the wild on red clover, in addition to Lespedeza and Desmodium. MBC records 2000-2007 rank both the Southern and Northern Cloudywings as “Uncommon” (Table 5). But the Northern is seen somewhat more frequently The 1986-90 Atlas termed Southern Cloudywing “uncommon to locally common”; however, it was found in only 20 of the 723 blocs searched, which would put it on the very low end of the “uncommon” scale. Northern Cloudywing was found in 82 of the 723 blocks, making it seem almost common by comparison. MBC sighting records for the two species show opposite population trends. For Southern Cloudywing Charts 73 and 73a show an overall increase in sightings per total trip reports between 1992 and 2009. On a year-to-year basis, sightings peak in 2004, but decline after that. (The raw number of Southern Cloudywings reported, and the number of reports, also show this same pattern, peaking in 2004 and declining thereafter.) For Northern Cloudywing, Charts 74 and 74a show the reverse: a decreasing trend 1992-2009. And finally, an important and slightly different analysis of MBC data which used list-length as a measure of effort came to the same conclusions. That study found a statistically significant 55.1% increase for Southern Cloudywing over the years 1992-2010, compared to 74.6% decline for Northern Cloudywing (Breed, Stichter, Crone 2012). The 1986-90 Atlas map had shown Southern Cloudywing only in the eastern part of the state. In contrast, BOM-MBC records (Map 73) show it now fully distributed throughout the state except for Berkshire County. (The only report is 1, 7/11/2008, Southern Berkshire NABA, no photo; this is shown on Map 73.) It is likely that the Atlas simply missed this uncommon species in the Connecticut River valley. Whereas the Atlas had only two records west of Sudbury (Rutland and Tolland), Southern Cloudywing is now seen to occur throughout the Connecticut River valley and central Massachusetts. There are virtually no reports from the higher elevations west of the Connecticut River valley. The distribution of Northern Cloudywing (Map 74) is similar, except that Northern Cloudywing has been found more extensively in the Berkshires and in the hill towns west of the Connecticut River valley. MBC records 1992 through 2013 show Southern Cloudywing in 67 towns across the state, as compared to 117 for Northern Cloudywing. The northernmost locations are in Essex County, with reports from Newburyport, Newbury, and West Newbury-- for example Newburyport 26 June 2010 http://www.pbase.com/bo_z/image/125976089 . Southern Cloudywing has been seen on the Central Franklin NABA Count nearly every year 1993 through 2013 (maximum 12 on 7/5/2003), testifying to the species’ ongoing presence in the area around Montague, especially at Turners Falls Airport. Southern Cloudywing has also been reported nearly every year from the Northern Worcester Count, based in Princeton. Good numbers have come also from the Concord NABA Count in several years (max. 10 on 6/30/2007). Both Southern and Northern Cloudywings may be less common on Cape Cod than elsewhere in the state. The only MBC records for Southern Cloudywing come from Falmouth, primarily Crane WMA, where Mello and Hansen (2004) also suggest it can be found. On Martha’s Vineyard Southern Cloudywing may be more easily found; there are good records from Manuel Correllus State Forest. The Vineyard checklist ranks it as “Uncommon” (Pelikan 2002). For Nantucket, there are historical specimens in the Maria Mitchell Museum, and local observers believe that this species is therefore likely to be found on the island (LoPresti 2011), although MBC as yet has no records. Acton Fort Pond Brook, 1, 7/5/2009, M. Rines; Falmouth Crane WMA, 10 on 6/30/2004, T. Hansen, 3 on 6/19/2013, J. Dwelly; Canton Great Blue Hill, 9 on 7/8/2006, M. Champagne and E. Nielsen; Carver/Plymouth Myles Standish SF, 5+ on 6/27/2010, M. Arey; Charlton Rt. 169 power line, 4 on 7/2/2001, R. Hildreth; Chicopee Westover AB, 2 on 6/21/1997 T. Gagnon; Montague Turners Falls Airport, July 1994, 1995, 2013, M. Fairbrother (ph. ); Newbury Martin Burns WMA, 7 on 6/27/2004, S. Stichter et al. ; Newburyport water tower, 2 on 6/26/2010, B. Zaremba, (ph. ); Sharon Moose Hill Farm, 3 on 7/5/2009, S. Jaffe; West Tisbury Old County Rd., 14 on 6/12/1999 M. Pelikan; Woburn Horn Pond Mountain, 7 on 7/4/2007 E. Nielsen et al. (ph. ); Worcester Broad Meadow Brook WS, 2 on 6/10/2012, R. and S. Cloutier (ph.). There is one brood at our latitude. According to 1993-2008 MBC records, the flight period in Massachusetts extends from the third week in May to the end of July at the extremes, but the most numbers are seen from the second week in June to mid-July ( http://www.naba.org/chapters/nabambc/flight-dates-chart.asp). For example, William D. Winter found at least three males in Medfield on 6/15/1974 (MCZ specimens, determined by J. M. Burns). In MBC records, the Northern Cloudywing has been seen flying slightly earlier and also slightly later than the Southern. Earliest sightings: In the 23 years of BOM-MBC records 1991-2013, the five earliest "first sightings" are 5/20/2012 Falmouth Crane WMA, J. Dwelly; 5/20/2004, Sunderland, D. Case; 5/24/1998, Holyoke, K. Parker and R. Pease; 5/25/2010 Athol pump house, F. Model; and 5/26/1997 Falmouth Woods Hole, A. Robb. The influence of the exceptionally warm springs in 2010 and 2012 is evident. In 7 of the 23 years the first sighting has been in May rather than June. There may be a slight tendency for sightings to become earlier over this time period. However, the Atlas early date was also in May -- 27 May (no year). Latest sightings: Over the same 23 years of records, the five latest "last sighting" dates are 7/31/2003 Canton Great Blue Hill, T. Murray; 7/22/1992 Lower Pioneer NABA, R. Pease; 7/21/2006 Blackstone Valley NABA, T. Dodd; 7/21/2002, Acton, E. Nielsen; and 7/19/2009 Chicopee, C. Kamp. There may have been some lengthening of the flight period, since the Atlas late date had been 7/14/1990, Sudbury, R. Walton. Scudder gives no flight dates for northern states, so no comparisons are possible. Southern Cloudywing is one of a number of more southerly species which have been increasing in Massachusetts over the past 25 years. Climate variables such as low winter temperatures and a short growing season may be the broad limiting factors in this species’ range, and if so, a warming trend in New England portends more breeding success here for this formerly southern species (Table 6). The Maine Butterfly Atlas reports recent records from at least one southern township, and suggests that the species may possibly be a “breeding resident”, rather than the “rare stray” it had been formerly (MBS, 2013). Thus far there are only two known records from Vermont, in 2004 and 2006, whereas Northern Cloudywing is common in that state (McFarland and Zahendra 2010). The species may also be increasing in Connecticut: in the 1995-99 Atlas, project records for Southern Cloudywing were somewhat more widespread and numerous than the pre-project records (O’Donnell et al. 2005).